Sluggish economy, drug cartel crime, controversial reforms, student murders and ensuing mass demonstrations mark Peña Nieto’s presidency. 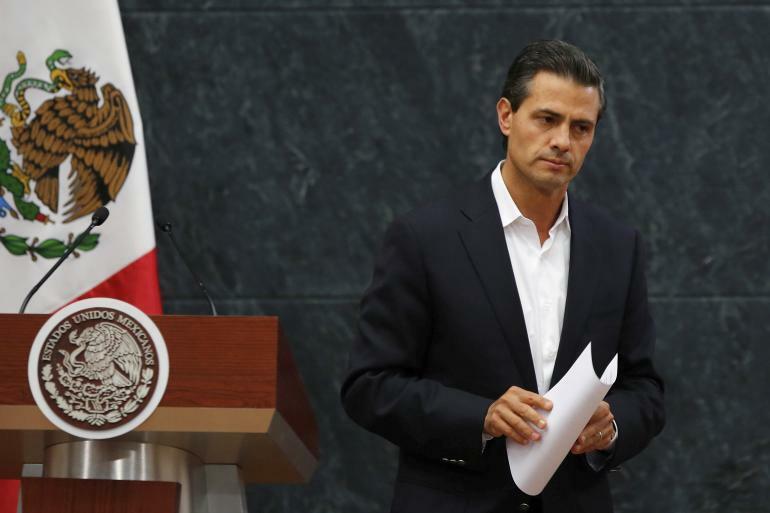 Mexico’s Enrigue Peña Nieto: A troubled presidency. Reuters photo. 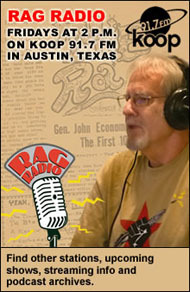 Philip Russell will discuss the state of Mexico and the Peña Nieto presidency on Rag Radio, Friday, Dec. 12, 2-3 p.m. (CT), on KOOP 91.7-FM in Austin and streamed live here. 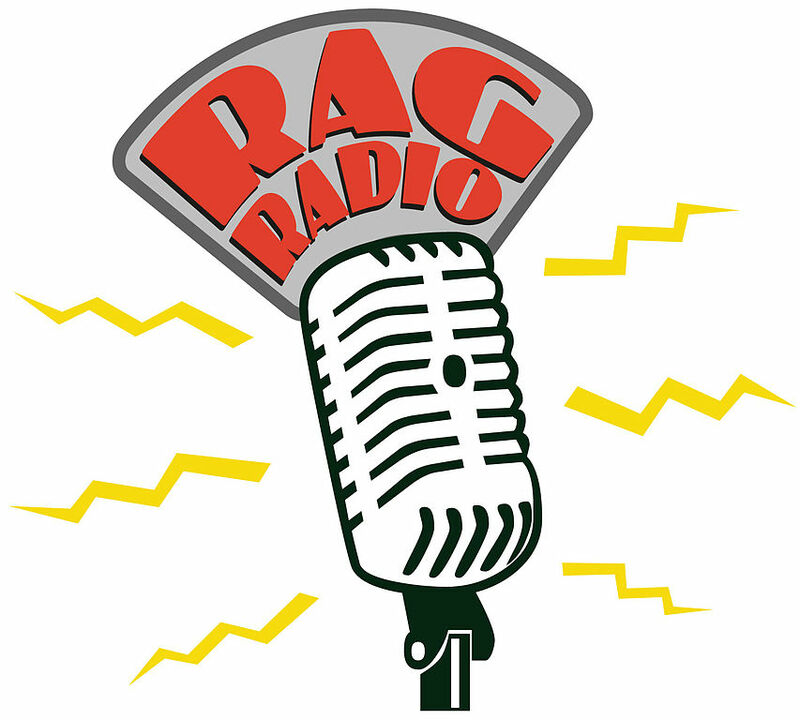 Joining Russell on the show will be Rag Blog Mexico City correspondent Johnny Hazard, who has been covering the demonstrations in Mexico. Mexico’s president, Enrique Peña Nieto, took office in December 2012 after receiving 38 percent of the vote in a media-driven, copiously funded, one-round election. Media hype spilled over from sympathetic Mexican TV networks to the international press. The Economist coined the phrase “Mexico’s Moment,” declaring that Mexico’s time had come. Polls have repeatedly shown that a sluggish economy (and the resulting low job creation) is one of Mexicans’ principle concerns. During the term of Peña Nieto’s predecessor Felipe Calderón (2006-2012) the economy only grew at 1.9 percent per year, lower than the 2.1 percent of the previous six-year term. The 1.9 percent growth figure almost matches population growth, meaning there was no change in wealth produced per capita. Worsening distribution of income left most Mexicans worse off and the one million annually entering the labor force with scant job prospects. On the campaign trail Peña Nieto criticized meager economic growth during his predecessors’ terms and charged that the jobs that had been created “were few, insufficient, of poor quality, and poorly remunerated.” He promised to at least triple the rate of economic growth. Rather than increasing, the rate of growth declined to 1.1 percent in 2013, well below the 3.9 percent of the previous year. This year economic growth has been only slightly higher, reaching 2.2 percent in the third quarter. Reasons behind the economic slowdown include new taxes cutting into consumer spending, reduced spending by the new administration, lowered oil export revenue, and a sluggish economy in the United States — the destination of most of Mexico’s exports. Even though Mexico’s economic growth is lackluster, a few sectors of the economy are booming. Mexico’s star performer is the auto sector, thanks to low wages (by international standards), well educated workers, proximity to the United States, and Mexico’s ability to export to the 40-plus nations with which it has trade treaties. During the first eight months of this year Mexico exported $55 billion in autos and auto parts — 1.8 times the amount earned by oil exports, 3.5 times remittances sent by workers in the United States, and 4.9 times that earned by tourism. Increased investment in the auto sector has pushed annual economic growth in the state of Aguascalientes, a major auto producer, up to 8.6 percent. However given the capital intensive nature of the auto industry and the amount of imported parts inserted into each assembled vehicle, the auto sector only provides half a million jobs — roughly one percent of the labor force. Rivaling a sluggish economy as a concern is what is generally referred to as “insecurity.” This concern has been chronic for years, but worsened after Calderón ordered the military to combat drug cartels. This effort fragmented cartels and led to an estimated 80,000 cartel-related murders during his presidency. To make matters worse, as drug trafficking came under heavier enforcement efforts, cartels branched out into kidnapping and extortion. Despite the widespread involvement of the military, as Michael Collins of the Drug Policy Alliance observed, during the Calderón administration the flow of drugs continued unabated and drug-related violence, human rights violations, and corruption increased. During the first 23 months of the Peña Nieto administration, 14,534 murders were linked to organized crime. During the first 23 months of the Peña Nieto administration, 14,534 murders were linked to organized crime. Rates of kidnapping and extortion have also continued at horrific levels, although given widely varying estimates, it is hard to determine if rates are trending up or down. 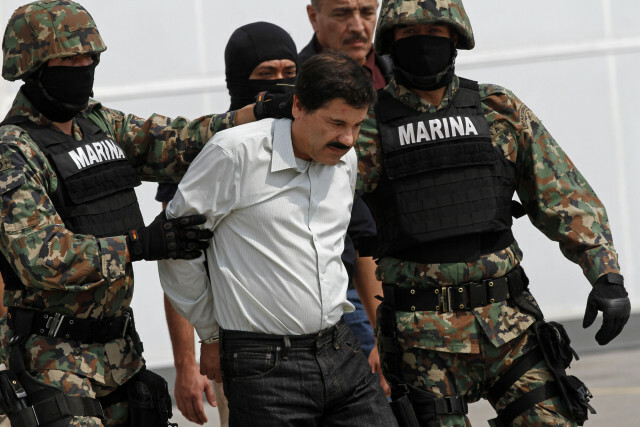 Drug lord Joaquín “El Chapo” Guzmán arrested in Mexico City, February 22, 2014. Photo by Marco Ugarte / AP. What is clear is that the illegal drug trade continues to rake in an estimated $20 billion a year — sufficient funds to corrupt innumerable public-sector employees at the local, state, and federal level. Peña Nieto’s response to this ongoing nightmare has been to simply talk less about it. Captured capos are no longer paraded on TV as occurred under Calderón. Peña Nieto’s major innovation in the drug war is the creation of a 5,000-person militarized police force known as the Gendarmaría. A June 2014 poll found 62 percent of Mexicans felt the government had failed to reduce violence related to organized crime. In contrast to the lack of progress in solving inherited problems, Peña Nieto has amazed even his critics with his ability to implement far-reaching reform (or to his critics, counter-reform) legislation. Since 1997 when the dominant Revolutionary Institutional Party (PRI) lost its congressional majority, it has been virtually impossible to pass significant legislation since the opposition in Congress was reluctant to allow incumbent presidents to pass legislation which would enhance the reputation of their parties and thus their ability to remain in power. At the beginning of his administration Peña Nieto ended legislative gridlock by forming an alliance known as the Pact for Mexico. 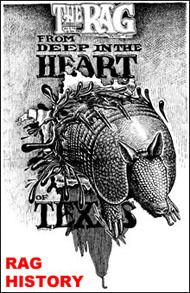 This alliance committed the three major parties and their congressional delegations to put aside partisan interests and pass reforms. The PRI joined the Pact to support Peña Nieto, its victorious presidential candidate. The traditionally conservative National Action Party (PAN) joined the Pact since after 12 lackluster years in power and a third-place finish in 2012, it wanted to be seen as still politically relevant. The center-left Party of the Democratic Revolution (PRD) wanted to polish its image as a key element of governance. The PRD also wanted to be able to shape reform legislation rather than simply criticizing it. The most controversial and far reaching of the reforms was opening up the energy sector to private domestic and foreign investors. By far the most controversial and far reaching of the reforms was opening up the energy sector — oil and electricity — to private domestic and foreign investors. Since its 1938 nationalization the Mexican oil industry has been closed to private investors, leaving all production and distribution to the national oil company Pemex. During the last decade Pemex production has declined from 3.4 to 2.4 million barrels a day and the company has been unable to find reserves to replace existing fields. Mexico’s oil reserves have declined from being the fifth largest in the world to being the 18th largest. 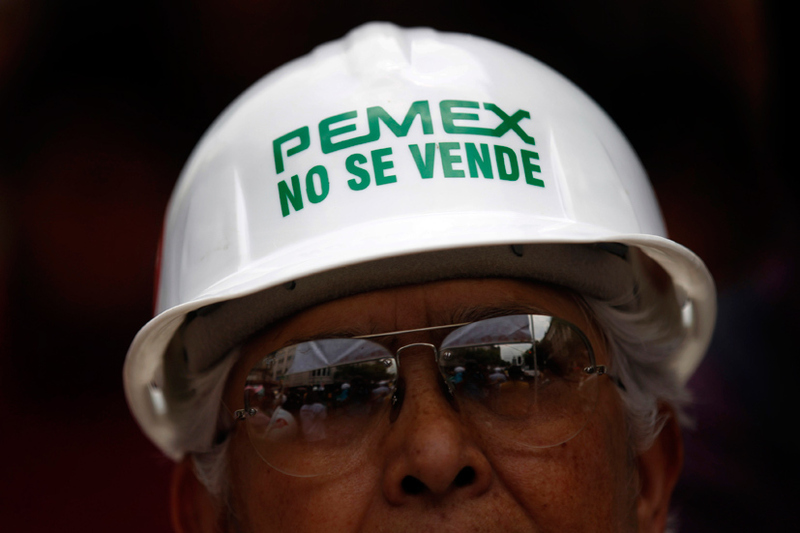 Furthermore Pemex has been plagued by rampant corruption and sky-high pension costs. This single reform will form a substantial part of Peña Nieto’s legacy, for better or worse. Already clouding the success of the reform are low energy prices which will deter new investment. Uncertainty resulting from cartel activity in many potential producing areas will also deter investment. Investors’ ability to work with a myriad of new energy-related government agencies adds more uncertainty. These agencies will be called upon to interpret four amendments to the constitution, nine new energy laws, and modifications to 12 other laws. The reform will take shape over years. Bidding on new sites won’t start until next year. Demonstrator against privatization of Pemex. Image from desinformemonos.org. Several other reforms have also been passed. An education reform seeks to raise the caliber of teaching in an attempt to improve Mexico’s woefully underperforming educational system. A telecommunications reform supposedly will instill competition in providing telephone service and television content. A fiscal reform increased tax collection, thus providing more resources to the government and decreasing reliance on Pemex revenue to finance government. Finally a political reform placed the organization of local as well as federal elections under the newly created National Electoral Institute (INE) and for the first time allowed individuals to become candidates independently of any recognized political party. The response to these reforms has split along left-right lines. Pro-business interests have proclaimed the reforms will lower energy and telecommunications costs, create jobs, and improve education. The left in turn charges that reform legislation results from caving into multinational interests. Militant teachers charge that education reforms are the forerunner of privatizing education. The strongest opposition concerned energy reform. Many in Mexico continue to share Lázaro Cárdenas’ (president 1934-1940) view that oil multinationals plunder producing nations, run roughshod over their governments, and leave nothing but dry holes and polluted landscapes. It was Cárdenas who nationalized the oil industry in 1938. Opposition to the energy reform at the time of its passage was sidetracked by López Obrador’s having a serious heart attack, thus preventing him from leading street demonstrations. Later the left sought to overturn the energy reform by collecting millions of signatures and thus repealing the reform by referendum. This effort ground to a halt when the Supreme Court ruled that the energy reform dealt with government income, an area which the constitution specifically excludes from being subject to referendum. The passage of the reforms marked the highpoint of the Peña Nieto administration. Peña Nieto never had a broad base of support, as is indicated by his only receiving 38 percent of the vote. By August 2014, after his shepherding reform legislation through Congress, his approval rating rose to 50 percent. In September he flew to New York to receive the World Statesman 2014 award. Then things turned sour, rapidly. After a June 30 shootout at Tlatlaya, 80 miles west-southwest of Mexico City, 22 criminals were reported dead while only one soldier was reported wounded. Such exchanges between the army and presumed drug traffickers are so frequent that it raised few eyebrows. Only when an eyewitness narrated in the Mexican edition of Esquire that the army had executed most of the 22 after they had surrendered did public ire become aroused. It became apparent, as many had previously charged, that the military was a major human rights abuser. Then on the night of September 26, students from the teacher training college at Ayotzinapa, Guerrero, commandeered a bus — a normal protest tactic — and headed for Iguala, Guerrero, a city of 110,000 located 75 miles southwest of Mexico City. Students declared they were attempting to raise funds so they could travel to Mexico City to participate in a commemoration of the October 2, 1968 student massacre. Apparently Mayor José Luis Abarca thought the students would interrupt a rally which was to have served as his wife’s de facto campaign kickoff to succeed him as mayor. Police opened fire on the unarmed students. He ordered police to prevent the students’ arrival. Police opened fire on the unarmed students. Six soon lay dead, including non-students caught in a hail of bullets. Police then took 43 surviving students into custody and turned them over to the area’s dominant drug gang, Guerreros Unidos. According to a November 7 statement by the attorney general’s office, gang members then killed the students, incinerated their bodies in a garbage dump, and disposed of their charred remains in a river. Soon media reports flooded in of close ties between Abarca, his wife, and Guerreros Unidos. The mayor resigned and went into hiding, although he was later apprehended. Guerrero’s governor was also pressured into resigning. Students and teachers protest against education reform in Mexico City in September 2013. Photo by Edgard Garrido / Reuters. Several things became apparent as a result of events in Iguala. One is that close ties exist between many local politicians and drug cartels. Another is that the 43 disappeared are only the tip of an iceberg. Last year 2,232 murders were tabulated in the state, which is known for its poverty, resistance to authority, and marijuana and opium poppy production. In searching for the 43, mass graves of other unidentified victims were encountered. The inability to quickly resolve even a high profile case such as this confirmed many people’s doubts about the effectiveness of government. Finally it indicated that Peña Nieto, who is so polished in scripted events, had no adequate response. Observers characterized him as “speechless” as he failed to engage with the matter for weeks. Two months after the shooting in Iguala, Peña Nieto did propose abolishing municipal police forces — notorious for being poorly educated and poorly paid — and replacing them with state police forces. That reorganization requires a constitutional amendment, so will have little immediate impact. Many have wondered what motivated anyone, even persons completely lacking a moral compass, to think the kidnapping and presumed murder of 43 students would further even the narrow interests of their drug gang or the mayor of Iguala. A suggested explanation is that the government’s success at picking off heads of large drug cartels has splintered them, leaving small groups such as Guerreros Unidos in the hands of aggressive young men who have spent years living with impunity for their many crimes and unable to evaluate how any particular action will be perceived by Mexican society. Violence became so pronounced that the nature of the protests began to obscure the original reason for the protests. Violence associated with the protests became so pronounced that the nature of the protests began to obscure the original reason for the protests. 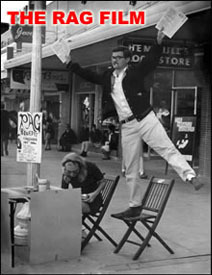 Some claimed government provocateurs carried out violent acts to discredit the movement. Others charged protesters with using the tragedy of Ayotzinapa students to further their own agenda. On November 20, the 104th anniversary of the Mexican Revolution, protests concerning the Ayotzinapa students reached their peak. In Mexico City, hundreds of thousands converged from three directions to meet in Mexico City’s main square, the Zócalo. Speakers, including parents of the missing students, berated the government. The dominant theme was the call for Peña Nieto to resign. Reflecting the generally low regard for politicians, one protestor carried a sign saying, “All politicians are Abarca.” Toward the end of the rally Peña Nieto was burned in effigy. The peaceful march was noticeable for bringing in a much wider range of participants than just students. The protest movement, which up until November 20 had been largely regional, extended its geographical reach. 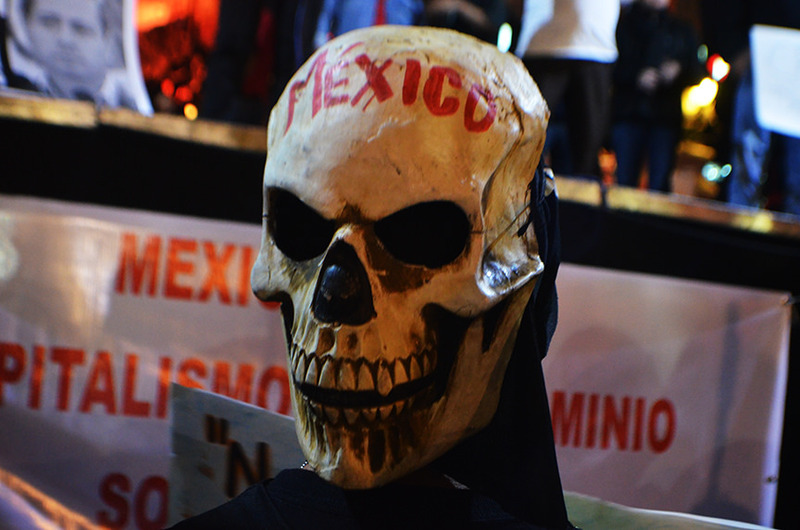 There were demonstrations in roughly 50 other Mexican cities. In addition, fueled by social media, solidarity events were held in countries around the world. Just when it seemed things couldn’t get worse for Peña Nieto, they did. Media began airing reports that in addition to the official presidential residence Peña Nieto and his wife occupied a $7 million Mexico City mansion. That was bad enough in a nation where half the population is officially classified as poor. To make matters worse, it turned out that first lady Angélica Rivera was buying the house on credit from a construction firm which had repeatedly received lucrative contracts during the time Peña Nieto was governor of the state of Mexico. The first lady claimed she was buying the house on credit, using money saved from her television acting career. Skeptics wondered how she could afford to pay off the $5 million balance on the mortgage since she was no longer working. Social media posted apocryphal notices that Hollywood stars were moving to Mexico since actors were so well paid. The construction firm which built the house and holds the mortgage had just received a $4 billion contract, along with the China Railway Corporation, to build a high-speed rail line from Mexico City to Querétaro. In an attempt to eliminate the appearance of cronyism, Peña Nieto simply canceled the rail contract. In response to mounting criticism, Mexico’s first lady denied any wrongdoing, but said she would sell the house. Public relations gestures aside, the government still appears to have a tin ear. These public relations gestures aside, the government still appears to have a tin ear. Its Special Missing Persons Unit is woefully inadequate by international standards. Nonetheless, in passing the 2015 budget, the Mexican Congress reduced the Unit’s appropiation by 63.5 percent. This occurred 48 days after the disappearance of the 43 students. The question has been raised if public reaction to the string of events beginning with Tlatlaya will mark a turning point in the Mexican political system or if protests will eventually fade and the nation will return to an uneasy calm. Since protesters have been largely students and other disaffected youths and protests have been largely confined to three states — Michoacán, Guerrero, and Oaxaca — and Mexico City, it appears the system will weather protests, just as it did during the1968 student movement and the Zapatista uprising in Chiapas in 1994. Assuming the system holds together, the next major political event will be next summer’s midterm elections for members of the Chamber of Deputies. None of the major parties has emerged in a strong position. The PAN still has to live down 12 years (2000-2012) of lackluster administration, as well as scandals during the current administration. PAN legislators were reported to be taking cuts on construction money they dollop out and to be partying with scantily clad women hired to entertain when they were supposed to be planning their legislative program. The PRI has suffered since events have shown the PRI administration has made little progress on fighting organized crime, revitalizing the economy, avoiding the appearance of corruption, or responding adequately to crisis. Its strength lies in its formidable political machine and its lack of credible opponents. Normally this would be an opportunity for the left to benefit from others’ problems. Presumably the one beneficiary of recent events is a party, MORENA, formed by the PRD’s 2006 and 2012 presidential candidate Andres Manuel López Obrador. He split from the PRD, charging it had become part of the ruling coalition, not part of the solution. Since his newly formed party has never nominated candidates, it has no black marks. However it faces the monumental task of grassroots organization. It will split the left vote with the PRD and two other small leftist parties. 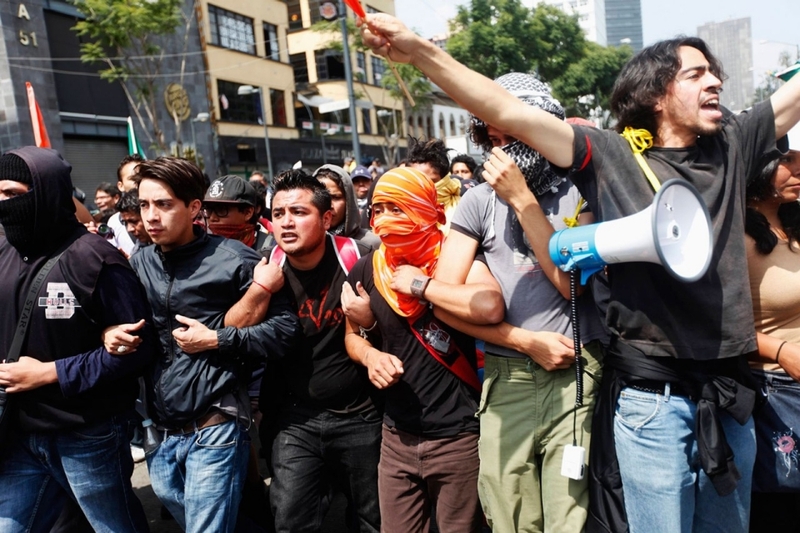 If there were run-off elections in Mexico, the left could coalesce in a run-off. However given one-round elections, a divided left will provide little challenge to the massive, if discredited, PRI machine. 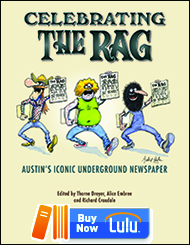 Read more Rag Blog articles about Mexico from Philip L. Russell and Johnny Hazard. This entry was posted in RagBlog and tagged Drug Cartels, Educational Reform, Enrique Peña Nieto, Mexican Economy, Mexican Massacre, Mexican Politics, Mexican Student Movement, Mexico, Mexico City, Pemex, Peña Nieto Series, Philip L. Russell, Rag Bloggers. Bookmark the permalink.